I don't drink a lot of mixed shots. When I'm buying, it's usually Patron or some kind of Bourbon (Wild Turkey, anyone?) But occasionally, someone will sneak in a round of SoCo Limes. Not a bad shot. I hafta say I prefer it over Jager shots - not to be confused with Jager bombs which are awesome. 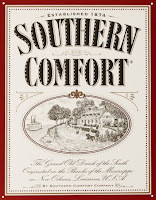 Well, Southern Comfort is coming this week on 9/17 and so it's time to RSVP. Brought to you by the spirit so surprisingly versatile you can use it to craft a margarita, martini, or Manhattan, underCOVER is a 10-city concert series starring either "choral symphonic rock" act The Polyphonic Spree, two-man power-disco wrecking crew Ghostland Observatory, or Springsteen-punk poets The Hold Steady, plus Flavor Flav-championed opener DJ Lord of Public Enemy, whose scratching is so thunderous, you will think he rolled around in poison oak. For the Boston event, the Polyphonic Spree will be headlining and the event will be held at the Paradise Rock Club. Click (here) to RSVP via Facebook. 0 Response to "SoCo Undercover - 9/17"